The weather here in the Northeast has been, to say the least, a little on the cold side. We are actually having a heat wave today – it was 5 when I got up, instead of some number with a – symbol before it. But, as is often the case, adverse weather makes some very nice photos. 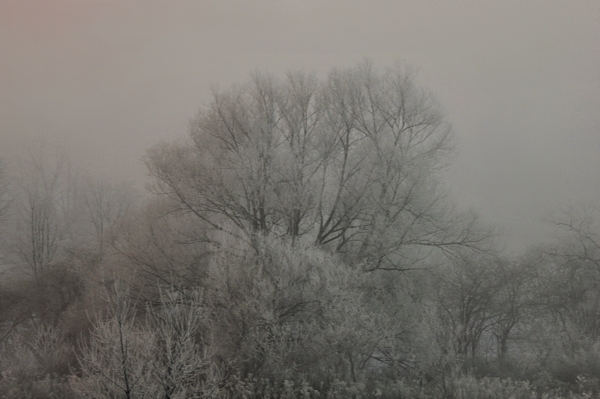 Like these foggy, frosty trees along the creek bottom in our valley. My frostbitten fingers aren’t nearly as picturesque though! Just saw this picture. I’m sure glad winter is finally over and hope it takes as long as possible to return, but it does have it’s own kind of beauty, doesn’t it?